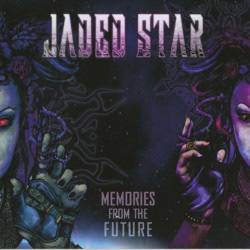 Let’s get the obvious out of the way from the off: Jaded Star’s debut outing ‘Memories From The Future’ is an exciting and effervescent offering which eschews the obvious in favour of a heavier, more dynamic approach. The songs carry a punch, although still have an accessibility which should help the four-piece garner some always gratefully-received airplay and roll out some crossover appeal, but at the end of each play of ‘Memories From The Future’ the overwhelming recollection is more about the power than the commerciality. The band – or at least its promo – centres on vocalist Maxi Nil, possibly best known for her work with Visions Of Atlantis on their two albums ‘Delta’ (2011) and ‘Ethera’ (2013) as well as 2011’s ‘Mary Magdalena’ EP; and Raphael Saini, “ex-Iced Earth” it says here but a man who’s drummed with seemingly more outfits than I have fingers and toes, including a short stint on the Visions Of Atlantis drum stool at the same time as Ms Nil was standing front and centre. Kosta Vreto, a tasty young guitarist with two solo albums to his name, and bassist Babis Nikou, a member of Astral DNA and another player with a CV as long as your arm (and again one with a live stint with VOA) complete this exhilarating outfit’s roll-call. With a pedigree such as this it would be unlikely if the band had produced a mutt of an album, and of course ‘Memories From The Future’ is a Cruft’s champion thoroughbred through and through. If you want a point of reference latter-day Delain would be a good place to start, although there’s a harder edge to the Jaded ones. If – and I’m guessing you are – you’re familiar with the VOA albums above you’ll already know that Nil has a terrific voice anyway, and the rest of the band are no slouches, between them writing and executing a clutch of ten attention-grabbing and punchy songs: there’s no fillers to be had on ‘Memories…’. If the energy levels dip a bit in the ballad ‘Into the End Of Time’ the excitement of the following cut ‘Healing The Inner Child’ or the opening coupling of ‘The Mask’ and ‘Wake Up’ more than average things out. Jaded Star? Supernova, more like!